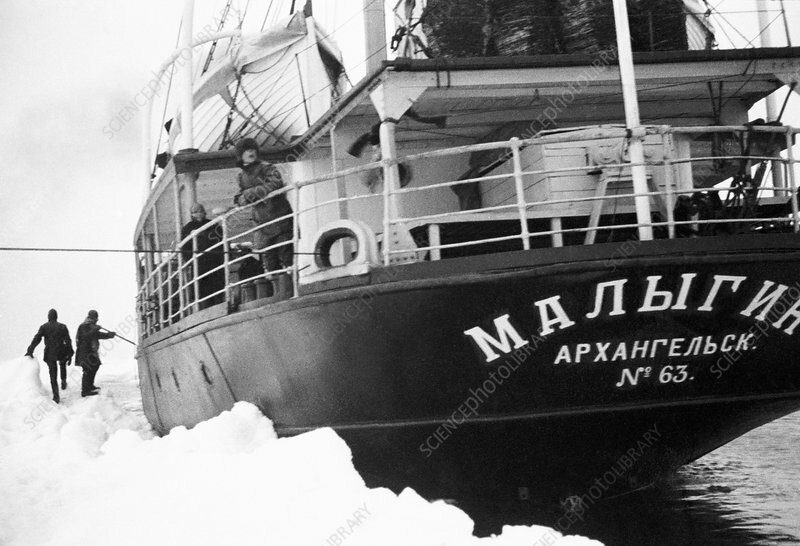 Malygin icebreaker in the Arctic in 1931. This Russian icebreaker was launched in 1912, and is here being used on a Soviet polar expedition led by Russian explorer and scientist Vladimir Vize. The expedition departed in July 1931, and travelled to Franz Josef Land, an archipelago located high in the Arctic. This expedition included a meeting with the German airship LZ-127 Graf Zeppelin (see C013/1343). The Malygin was just under 80 metres in length, and carried a crew of 98. It was returning from a hydrographic expedition when it was lost with all hands on 28 October 1940 during a storm near the Kamchatka peninsula.